It has been observed that on an average more than 8 in 10 homeowners in Ireland would look to add a home extension or alter their houses in one way or another, after five years of stay. Being a leading construction and design company in Dublin, at NÜHAUS, we completely understand this need for homeowners. Extensions are sought by the homeowners for a variety of reasons. The arrival of a new member in the family, newer needs because of growing kids, turning an unused room into your office-at-home are just some common examples. In terms of adding value and utility to your property, extensions can be very effective as they can be integrated in various ways to reduce your energy expenses and improve your style and efficiency of living. We, at NÜHAUS, specialize in sharing your vision for the extensions and help you all the way to make it happen. The extensions we design and construct are aimed at improving the overall value of your property while meeting your needs. Having well-built extensions is much easier and cheaper than moving houses, all the while adding utility to the property. Extensions like modern and modular kitchen supplements, converting existing room spaces to your at-home office or turning your basement into a well-equipped gym require good designs and plans. At NÜHAUS, we offer architectural design services along with construction services. This will save you a lot of time and the construction will be just as per your expectations. Extensions that are aimed at reducing energy costs (e.g. radiator repositioning or renewable energy solutions installation) or improve plumbing (e.g. kitchen plumbing revamping or construction of a new bathroom) need special efforts to integrate into your existing infrastructure. In case of energy/electricity/plumbing extensions, our expert designers and the construction team will ensure that extensions don’t disrupt the already existing utility network. The completed work will be duly checked and certified by our chartered engineers. All the design and construction work that we carry out for you will be strictly as per the planning and construction regulations set out by the local authority and in compliance with health and safety norms. 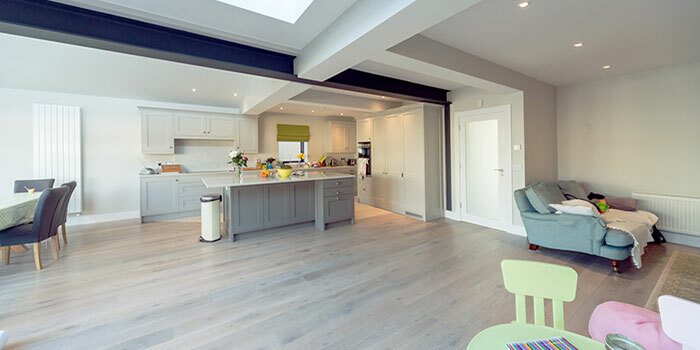 To conclude, if you are looking for builders in Dublin to see the construction of house extensions through to the completion, NÜHAUS is the best design and construction partner you can have.